Emery's (1895h) description is at . Arnold (1917: 380) gave a translation, this is at . Forel's (1910c) description of escherichi is at . 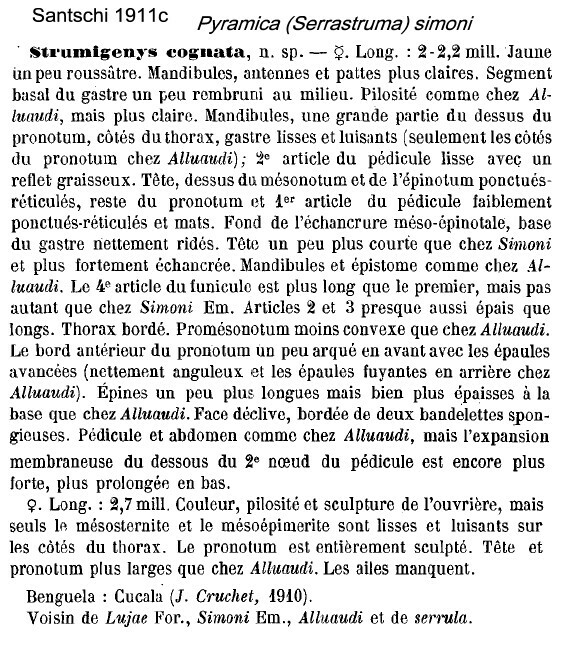 Santschi's (1911c) description of cognata is at . 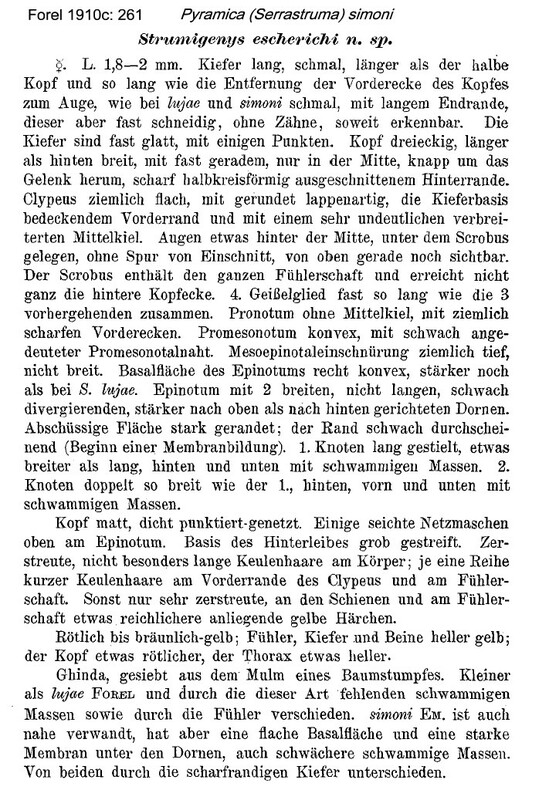 Forel's (1913b) description of cliens is at . 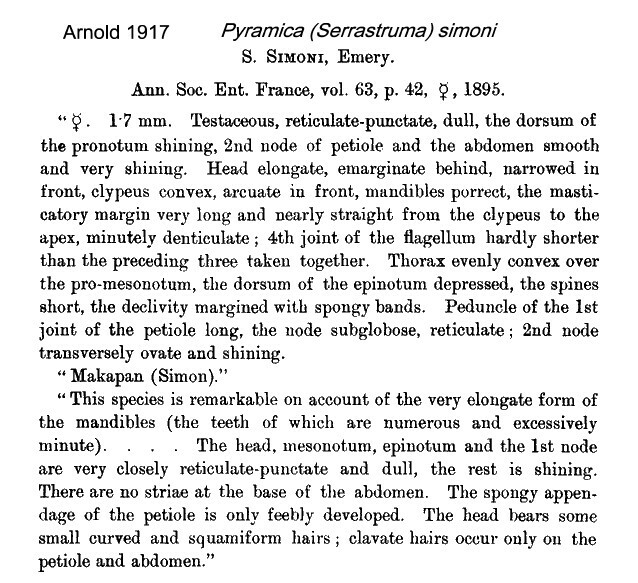 Santschi's (1914b) description of biconvexa is at . 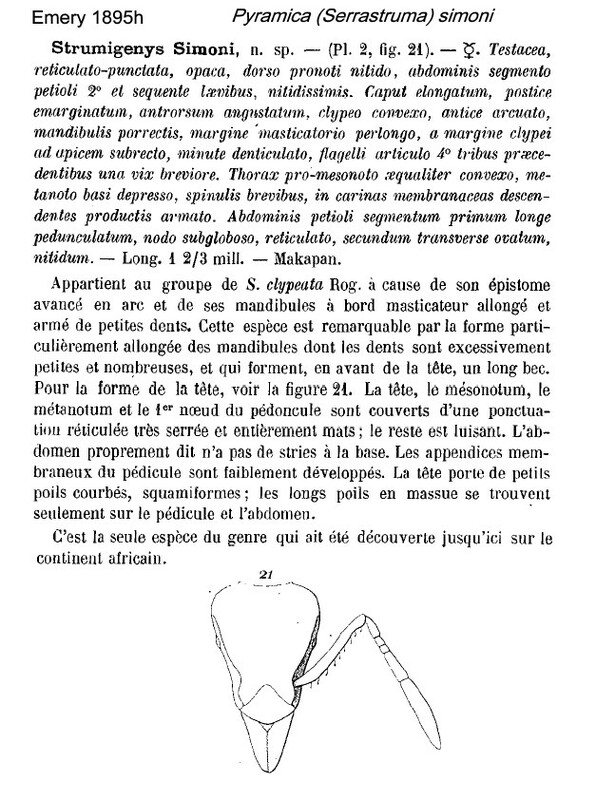 Santschi's (1914d) description of obscuriventris is at . 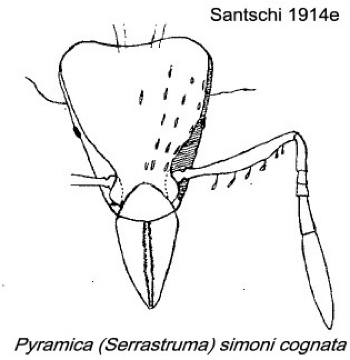 Santschi's (1914e) illustrated description of cognata boerorum is at . Arnold (1917: 381) gave an illustrated translation of limbata, this is at . 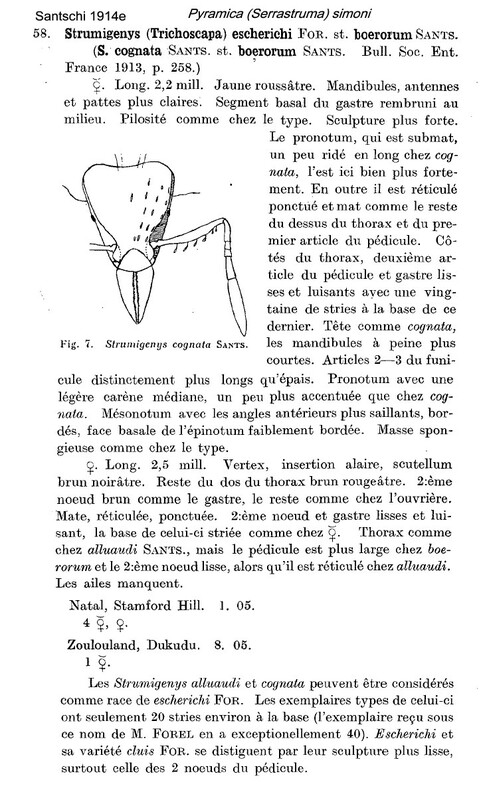 Arnold (1917: 383) gave an illustrated translation of cognata boerorum, this is at . Bolton's modern description (1983: 350, illustrated), as Serrastruma simoni, is at . Erect hairs relatively long, narrow and clavate, several on the occiput, paired fine long sinuous setae at the humeral angles of pronotum and on the head above the eyes. Eyes small. Alitrunk reticulopunctate only on the dorsum of the mesonotum and propodeum. Colour golden yellow. I collected it from soil and leaf litter at the base of a cocoa tree, both at the Cocoa Research Institute of Nigeria, Idi Ayunre. 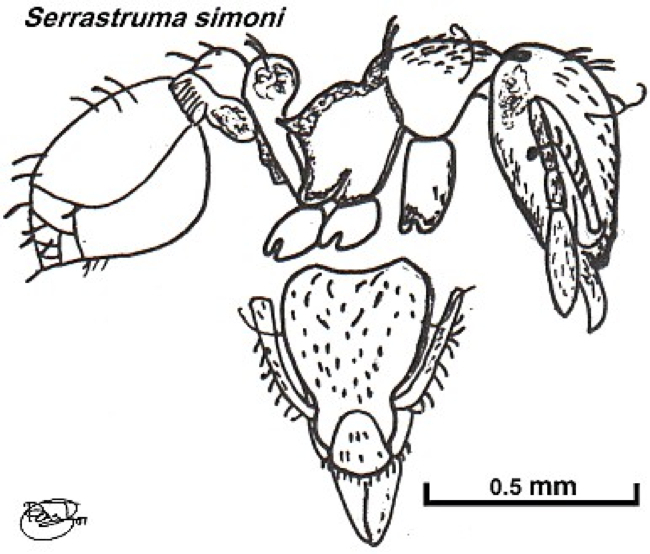 The species is quite distinctive, however, and my illustration seems unmistakably simoni, even though the specimens are smaller than the wide range given by Bolton. A specimen was in my voucher collection deposited with Bolton so the lack of its inclusion in his review is a puzzle. Bolton (1983) gave the distribution as throughout eastern and southern Africa, with many records. He was puzzled by the Nigerian record, the collection by F. Silvestri at Olokemeji, commenting that the sample might represent an introduction or a mislabelled series. 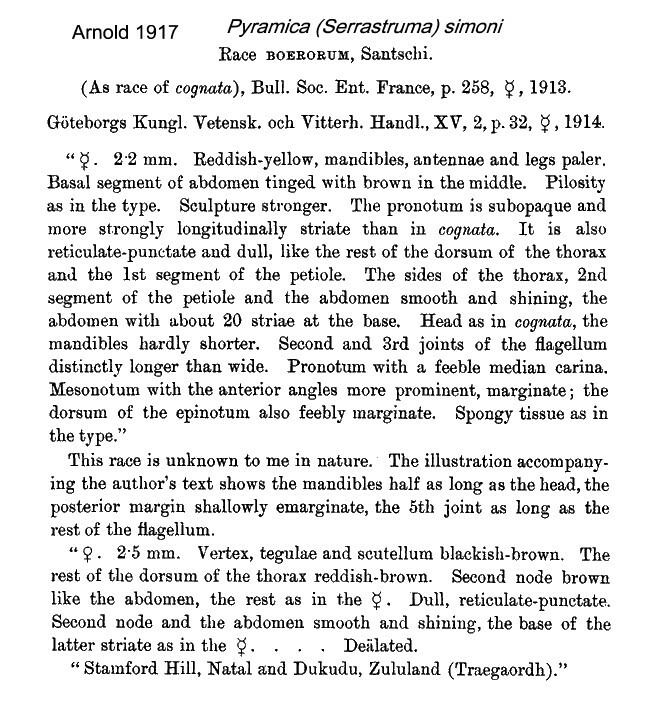 He did give more details of the Nigerian finding as Strumigenys (Trichoscapa) escherichi strain cognata variety obscuriventris named by Santschi (1914b, from the Silvestri 1913 expedition collection at Olokemeji); this was changed by Santschi (1915) to variety fusciventris (also as such in Wheeler, 1922). Bolton seems to have missed the report by Bernard (1952) of 4 workers from Guinea, Mt. 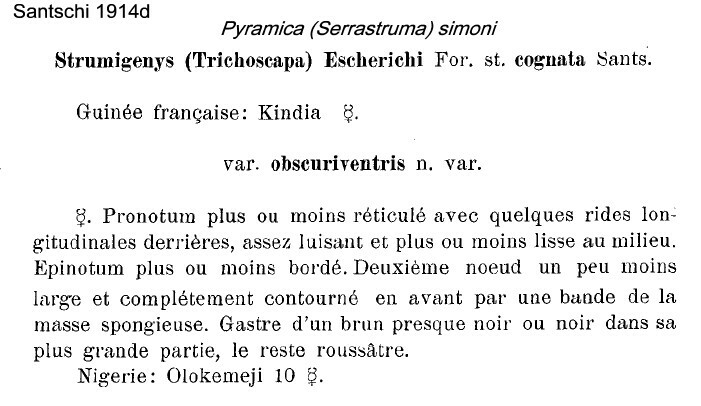 Nimba, Nion Crest, 1300 m, which he found matched the race "Strumigenys (Cephaloxys) escherichi subspecies cognata Santschi" from Congo and Angola; plus his note that the western form of the common (?) escherichi, had been taken in numbers notably at Banco, Ivory Coast. Wheeler (1922) listed the Nigerian record, also escherichi subspecies cognata from Guinea (Kindia, by F. Silvestri), both are in Santschi (1914d). Brown (1952) felt that it was at home in the more open forest and savannah, with colonies in rotten wood, under stones, and in the soil cover. The photomontage of a the type worker of raymondi is collated from - http://www.antweb.org/specimen.do?name=casent0102255; examined and syniymized by Bolton (1983). The Emery holotype essentially now is lost, fragmentary remains are shown on http://www.antweb.org/specimen.do?name=casent0102079 . The photomontage is of a specimen collected from Usambara Mts, Tanzania; Zigi Lodge, Amani NR; S 5°05' E 38°38'; 2200 m; Vasily Grebennikov, 9-11.x.2002. 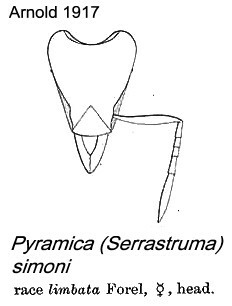 This shows the arcuate propodeum dorsum of biconvexa as shown by Santschi (1914b) for a specimen from Kenya (shown above).